"A favorite recipe at Christmas that can become someone's favorite gift. Share it with the ones you love." 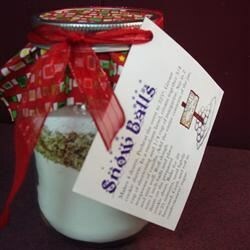 Snow Balls, Makes 4 dozen. Preheat the oven to 325 degrees F (165 degrees C). Grease cookie sheets. In a medium bowl, cream together 3/4 cup of shortening and 1/4 cup of margarine. Stir in 2 teaspoons of vanilla. Add the entire contents of the jar, and mix well. Roll dough into 1 inch balls and place them on the prepared cookie sheet. Bake for 20 to 25 minutes, until lightly browned. Cool, and roll in confectioners' sugar. Peanut butter and chocolate in a bite-sized, no-bake ball. I just rolled these in balls and flattened with a fork. I sprinkled with sugar and baked at 375 for 8 to 10 minutes. Pretty good! I have wanted a recipe like this for years. It was great!